Stepper motors follow a laundry list of x/y axis coordinates provided by the controller. The torch proceeds to each point in the file, perhaps a half a thousandth of an inch apart, both axes working in precise synchronization with each other. 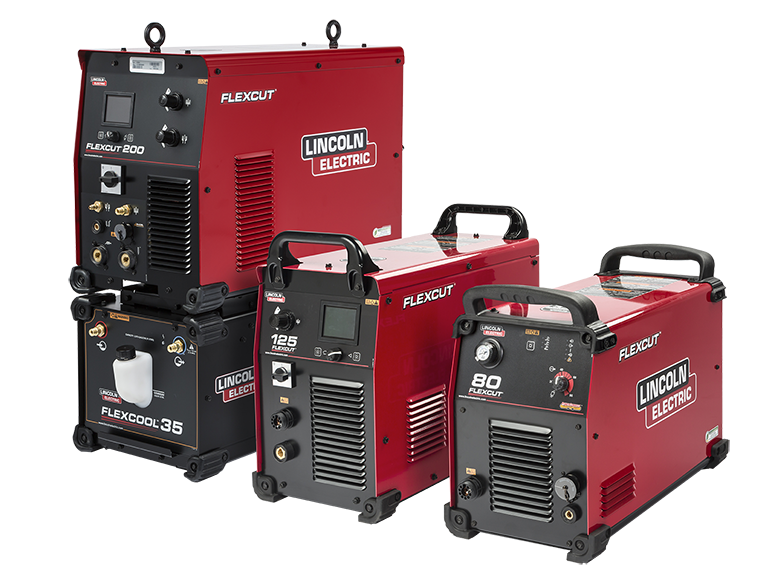 The relatively simple circuitry involved provides great reliability, good low speed torque, and easy set-up. Positioning errors don't occur, since stepper motors know in advance where they are going and when to stop. Servo motors depend upon "closed-loop" circuitry to supply information back to the computer so that positioning errors can be continuously corrected. This feedback is provided by encoders, which in some respects, are like the bicycle wheels that some road builders and others use to measure distances. A new type of servo motor called an "intelligent servo motor" has recently appeared on the scene. It is useful for some applications, and we use it in our automatic torch height controls. In fact, we probably purchase more of them than any of our competitors. The motor has some programmable computer circuitry incorporated into it, which lets it independently follow simple instructions. It works well with our torch height controls, due to their low torque demand. We believe intelligent motors are impractical for driving a cnc machine, for reasons given below. The following paragraphs explain each of these types of motors in more detail. Stepper motors are relatively inexpensive, and provide the same or greater accuracy as servo motors. Sufficiently powerful stepper motors for a given application do not lose steps. Stepper motors are no more likely to lose steps than a servo encoder is to pass bad information back to the controller. This hoax is pure hype generated by manufacturers who are either unfamiliar with stepper motors, or who are distorting facts to market their particular product. If for some reason a stepper motor does encounter an obstacle it can't overcome, such as a tipped up plate, it will simply skip steps, hurting nothing. If a servo motor encounters the same obstacle, it will sit there and fight itself until it breaks a gear tooth or burns up. If a stepper motor goes bad, which can happen to all three types of motors, replacement cost is under $200.00. No elaborate tuning process is needed to keep it functioning accurately. Best of all, its excellent low rpm torque lends itself perfectly to cnc plasma and oxy-fuel shape cutting, without the need for backlash producing gearboxes. The low speed torque makes it possible to use a timing belt and pulley reduction, with virtually no backlash. 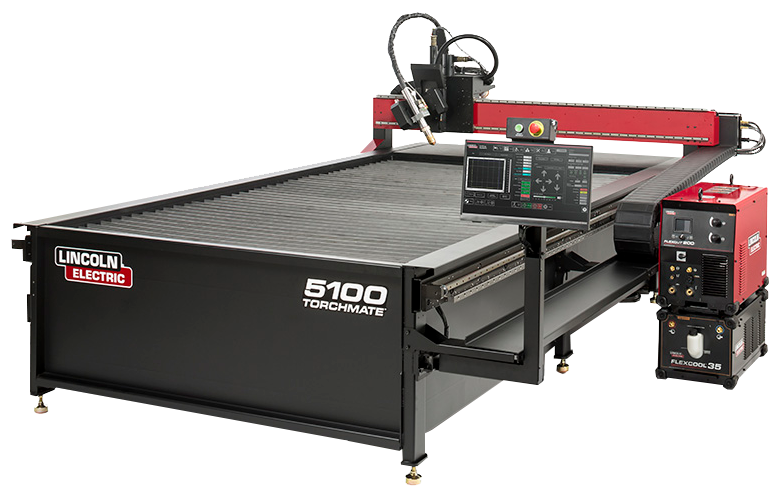 Bear in mind that the vast majority of cnc cutting movements with stepper motors are at less than 300 rpm motor speed, which translates to about 130 inches per minute on Torchmate machines. Cutting speeds and rapid traverse moves up to about 350 inches per minute are possible, although cutting would rarely require speeds in excess of 150 inches per minute. Rapid traverse moves faster than 350 inches per minute are virtually never needed, as the distance between pieces being cut rarely provides sufficient time for ramping (acceleration and deceleration). Don't be taken in by claims of super fast speeds. The more important issue in cnc plasma and oxy-fuel applications is how slow a move a machine can make. Oxy-fuel cutting of thick steel can require speeds as slow as 2 or 3 inches per minute. The use of dual X axis motors is easier and more precise with stepper motors than with intelligent motors, which require instructions to be passed along from motor to motor in kind of a daisy chain, rather than directly to both motors from the controller. With steppers, the two motor drivers receive identical simultaneous instructions from the computer, one in reverse of the other, reducing the chance of mis-communication. Servo motors are somewhat more expensive than steppers -- perhaps double the price, or more. They are generally just as accurate, if maintained in a proper state of tune, however they rely on encoders to provide positioning information back to the computer. Thus the complexity of the system is at least doubled, with no accuracy advantage, greater initial cost, and more maintenance issues. The "closed loop" rhetoric that some manufacturers play up sounds convincing to the uninitiated, but provides no benefit over a simpler and more reliable stepper system. Servo motors are available in larger sizes than stepper motors, and powerful servos are generally used on heavy machines with gantry carriages in the 500 to 1,000 lb range. They offer no advantage whatsoever on lighter machines, such as Torchmate and its competitors. 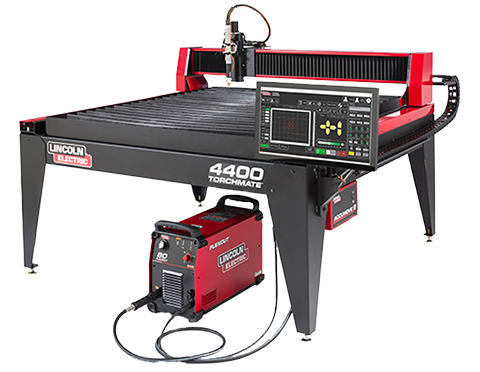 The argument given by cnc cutting machine manufacturers who use these motors is that since they perform some of the computing internally, there is no need for external electronics that might break down. They also claim that intelligent motors reduce the amount of cabling necessary. This, of course, is baloney. Since intelligent motors combine mechanical parts with computer circuitry, they are more likely to break down than external electronics with no moving parts. Which is more likely to break down, a television/dvd player combination, or a regular television set? When intelligent motors do break down, the replacement cost is about $600 a pop. Also, consider the fact that intelligent motors are directly exposed to cutting debris and plasma dust, unlike external electronics that can be situated 20 or more feet from the cutting table. In this photo, the cabling on the left controls two intelligent motors. Two cables get connected to each motor. Additional custom cabling connects a control box to the computer. The same length of cabling used to control two stepper motors is shown on the right. Only one cable is connected to each motor. The two cables to the right of the motors are extension cables, which can be added to increase the working length. A standard printer cable connects the controller to the computer. Which set of cables is more complex? Small intelligent motors with 50 oz. in. peak torque and 28 oz. in. continuous torque are used on one new competitor's cnc machine, although this is disguised by the citing of output torque at the gearbox. Although these small motors are expensive, larger intelligent motors would be far more costly. The only way these relatively low power motors can drive a gantry on a cnc machine is to run them at a very high rpm with a large gear reduction. This is kind of like driving your stick shift car around in low gear. This high rpm greatly increases motor wear, and introduces planetary gearbox backlash into the equation. When a gearbox first turns in one direction, and then the other, as in cutting a circle, the backlash in the gear train must be taken up before the direction changes. Unless super-expensive low-backlash planetary gear boxes are used, as on the large $100,000 plus machines, circles don't end up in the same place they started, etc. This photo shows the difference between an "intelligent servo motor" and a full-fledged brushless servo motor from an $18,000 Burny Phantom cnc control system, as found on machines costing over $100,000. The difference is obvious. The Burny motor (top), while a servo unit, is far larger and more powerful, and can easily loaf along at the relatively low speeds needed for cnc cutting without the wear of high rpm operation. The planetary gearbox on the Burny motor is a low backlash unit with 3 arc minutes of backlash, as opposed to cheaper planetary gearboxes with 6, or even 12 arc minutes of backlash. If you are considering the use of motors with planetary gearboxes, be absolutely certain to find out the manufacturer and model of gearbox you are buying, and verify the backlash specifications on that manufacturer's web site. Don't rely on gearbox specifications provided by the company selling you the cnc machine. While most driver software, including ours, has a backlash compensation feature, it is never as accurate as the lack of backlash in the first place. In our view, the only satisfactory type of moderate-cost drive system uses powerful stepper motors in conjunction with a timing belt/pulley reduction without backlash. We have tried them all. Despite claims by competitors that they are ahead of everyone else because they spent years designing software to operate intelligent motors, the software they are using is a generic software package developed for the manufacturer of intelligent motors. A few minor changes have been made from the basic program, which the developer is willing to do for OEM re-sellers. Years may have been spent developing the software, but not by our competitors. The software is readily available to us, or any other company.